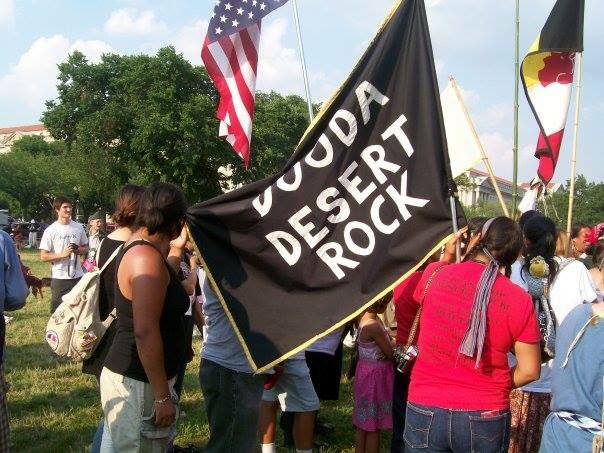 Photo courtesy of Dooda (No) Desert Rock. I have messages for Mother Earth to share from Elouise Dixon-Brown, president and founder of Dooda (No) Desert Rock organization, and Wahleah Johns, coordinator for Black Mesa Water Coalition Solar Project. WE, DOODA (NO) DESERT ROCK ORGANIZATION WILL BE TRAVELING TO THIS PUBLIC HEARING……….. Although the desert rock proposal is a DEAD issue, we still need to have our voices heard to protect the environmental issues that arise my dear friends! PLEASE JOIN US, CALL US AT 505 592 1453 AND IF YOU CAN’T PLEASE SEND IN YOUR COMMENTS ! We have an obligation to protect our children and future generations from the impacts of climate change by addressing its main cause: carbon pollution from power plants. The EPA’s Clean Power Plan does just that, drawing on the strength and ingenuity of American innovation to slash dangerous carbon pollution being dumped into our air while driving investment in energy efficiency and clean energy that will power the 21st century. The Clean Power Plan means we will never have to choose between healthy communities and a healthy economy. Power plants are responsible for 40 percent of the carbon pollution in the United States, our single largest source. Carbon pollution fuels climate change, which triggers more asthma attacks and respiratory disease, worsens air quality, and contributes to more frequent, destructive, costly and deadly extreme weather events. The Clean Power Plan will prevent up to 150,000 asthma attacks and 6,600 premature deaths annually by 2030. While we already set limits for mercury, arsenic and lead, polluters are taking advantage of a loophole allowing them to dump unlimited carbon pollution into our air, fueling climate change and putting our health at risk. The Clean Power Plan means less carbon and more jobs, as states around the country use the flexibility it allows to craft plans that fit their needs and build on the progress they’ve already made. Public Hearing on EPA’s Proposal to Limit Carbon Pollution from Power Plants in Indian Country. The Environmental Protection Agency (EPA) issued a supplemental proposal to the Clean Power Plan to address carbon pollution from power plants in Indian Country and U.S. territories. EPA is holding a public hearing where you can make your voice heard and support this effort to cut carbon pollution and to protect communities. WHEN: November 19, 2014 9:00 a.m. – 8:00 p.m. Include “EPA-HQ-OAR-2013-0602” in the subject line. By Fax: Fax comments to: (202) 566-9744. — with Young Environmentalists Tanzania, Yaynicut Franco, Yvonne Multine and 28 others in Washington, District of Columbia. BMWC and many others are helping to coordinate transportation and carpooling from Flagstaff region and Gallup for the hearing on Wednesday. Please let me know if you are interested in carpooling and attending! Registration is only required for individuals wishing to present oral testimony. You do not need to register if you only plan to attend and listen to the hearing. There will be a lunch break from 12:00-1:00 p.m. and a dinner break from 5:00-6:00 p.m.
100 N. 3rd St., Phoenix, Arizona. registration, please contact Ms. Pamela Garrett by telephone at 919-541-7966. Please note that any updates made to any aspect of the hearing will be posted online at this web site. People may also comment on the supplemental proposal online or by email, fax or letter: EPA considers all comments equally, no matter how they are submitted. The comment period on the supplemental proposal is open until December 19, 2014.